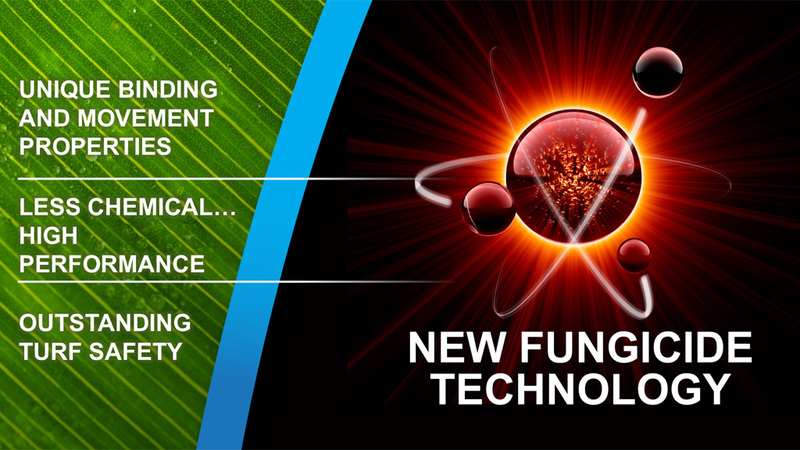 The launch of an exciting new fungicide active for turf disease control now gives a powerful combination of curative and contact plus systemic properties, for reliable turf protection outside and in the plant. Now approved for Microdochium control in the UK, Instrata Elite combines the new active ingredient, difenoconazole, with the outstanding performance of fludioxonil. Together, the complementary actives target different stages of disease life cycles for flexible application timing and reliable results. Syngenta Technical Manager, Marcela Munoz, highlighted extensive trials have shown Instrata Elite is highly effective against key turf foliar diseases, to protect plant health and playing surface quality. Importantly, the new approval gives the opportunity for two applications per year. “The unique properties of Instrata Elite rapidly bind the actives onto the leaf wax layer,” explained Marcela. “The fludioxonil component stays locked into the leaf wax to provide a protective contact coating that stops disease spores germinating and prevents infection of the plant. 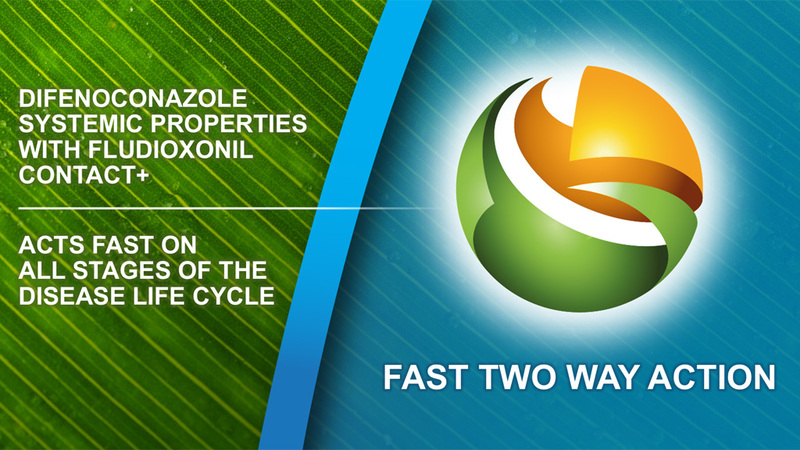 “At the same time, the difenoconazole component immediately starts to flow from the leaf wax into the leaf. It targets disease already active in the leaf, providing early curative activity and preventing symptoms breaking out,” she added. The flow of difenoconazole from the leaf wax reservoir provides systemic protection throughout the plant, to protect new growth and ensure lasting results. Crucially, with Instrata Elite safely locked onto the leaf wax within 30 minutes of application, it is unaffected by rain or irrigation wash-off ensuring reliable results. Marcela (above) highlighted that two applications of Instrata Elite per year will give greater flexibility to effectively target disease for longer through difficult high risk periods. Importantly, the new approval covers golf and amenity turf, along with sports pitches and stadia, she added. The consistently reliable performance of Instrata Elite has been proven by over 60 trials across nine European countries – including STRI, Syngenta and on golf courses across the UK. STRI has been successfully using Instrata Elite in disease trials over the last two years, reported the independent turf R&D organisation’s Research Manager, Tom Young. “Instrata Elite has consistently shown excellent control of Microdochium nivale, especially when applied preventatively, or early curatively when used as part of a balanced fungicide programme,” he advised. When applied as a single application in the STRI trials, either preventatively or early curatively, Instrata Elite has delivered reliable and high levels of Microdochium control, Tom added. 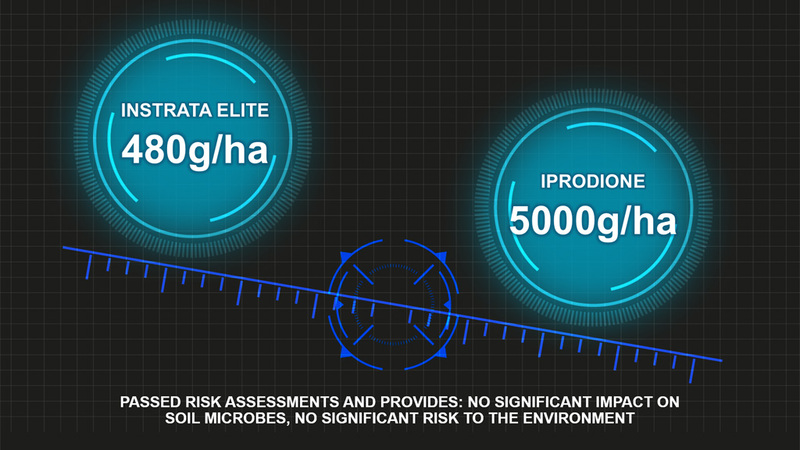 Furthermore, Instrata Elite achieved the outstanding performance from only 480 g/ha of active ingredient per hectare, compared to 5000 g/ha of active loading with iprodione. Instrata Elite had passed all environmental assessment tests through the approval process. He advised that for best protection of turf quality, Instrata Elite should be applied before visible symptoms are evident, through to first signs of infection. “Optimum timing will prevent disease infection getting into the leaf,” advised Daniel. “But with Instrata Elite there is still the chance for curative activity on mycelium in the leaf to stop disease before visible damage is done and minimise stress on the plant." 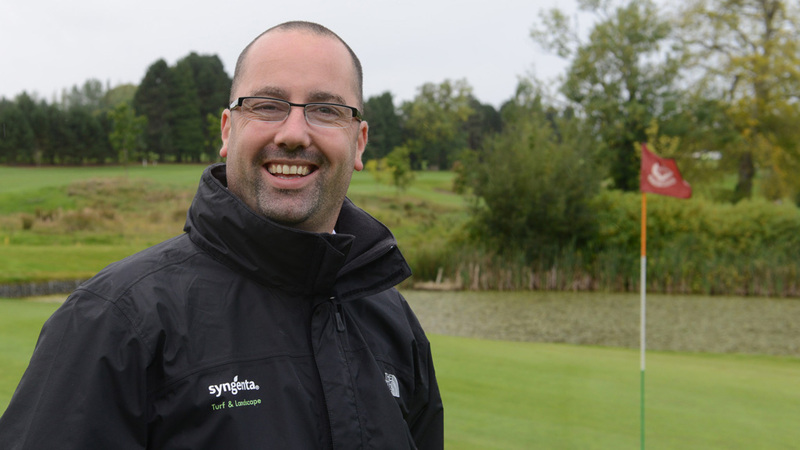 Daniel advocated the use of the GreenCast website information, indicator greens and historic experience to highlight risk periods to devise an appropriate fungicide programme strategy and to tailor specific application timing. 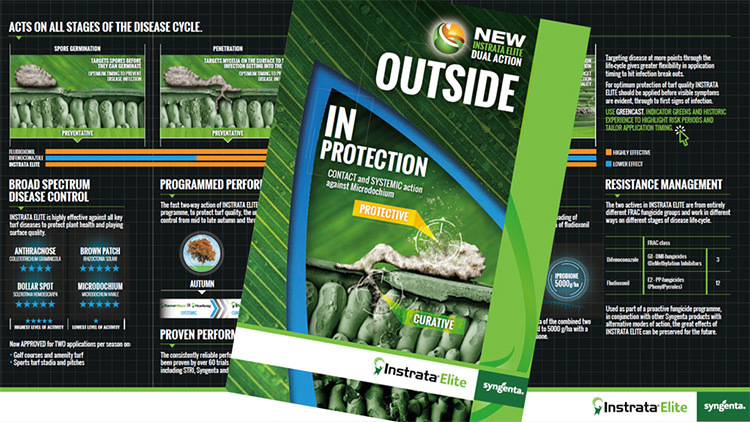 Download the brochure to find out more about how Instrata Elite can work for better disease control on your course or stadium turf.